The threat facing the NWO is that the economic bait has turned out to be poison. The EMU is based on a common central bank and a common fiat currency. But without a common system of government, there can be no fiscal union. There can be no central planning by Keynesian means. The nationalism implied by Keynesian fiscal manipulation has led to the Greek crisis. The EMU rested on an unlikely premise: the wisdom of Europe's commercial bankers, who had spent their careers in highly regulated domestic markets. Always before, bankers in large banks could count on their national central banks to bail them out. But, in this new world banking order, the European Central Bank does not have the flexibility to bail out all of the large national banks that are now in big trouble. There are members of the ECB's board who are part of the German-Dutch axis, which favors tighter money and stable prices. The Board must placate them to some degree. This reduces the ECB's response time. The Party Line of the EU and the ECB is that there is no unity-threatening problem or series of problems facing the central government. They insist that the current problems are temporary. The greatest event of my life was the suicide of the Soviet Union on December 31, 1991. The Communist empire went under without a shot being fired. The Communist Party's senior officers looted the Party's funds and sent the money to Swiss bank accounts. Then they privatized the state's main economic assets so that they and their cronies became incredibly rich. The second greatest event was the decision of Deng Xiaoping in 1978 to free up Chinese agriculture. That led to the most rapid economic growth in human history. Nothing like it had ever happened to so many people. South Korea's per capita economic growth, 1950 to 1990, was greater, but South Korea was a much smaller nation. Communism was the most powerful ideology of tyranny in man's history. It failed operationally in the USSR in less than 75 years. It failed in Communist China in less 30 years. The cash nexus seduced the vanguard of the proletariat. The inevitable socialist victory was exposed as a gigantic fraud. The messianic religion of Marxism went down with the two Communist ships. Today, the rag-tag army of tenured Marxist professors in Western universities have as their only surviving models Cuba and North Korea. The satellite photo of the two Koreas – bright lights in the south, one light in the north – is the most powerful epitaph of Communism there is. Now another victory of liberty over centralized politics is unfolding. It is taking place in Western Europe. It is not going to be reversed. The New World Order's number-one poster child – the European Union – has begun to fall apart. Nothing will reverse this. There are those in the West who will deny this. There are also those who from 1992 until today insist that the collapse of the USSR was in fact a gigantic deception. The Communists are still in control, they tell us. These people cannot bring themselves to admit that Communism lost the battle. Like the original Communists, they believe in the absolute sovereignty of political power. They believe that the West could not possibly have won, because the Communists were better at intrigue and military power. But the West did win, because the Communist leaders gave up the dream of a socialist world and decided to go for the money. Let me tell you how I knew that the Communists had failed completely. First, the new Russian government changed major cities' names back to their pre-Bolshevik names. Leningrad became St. Petersburg. Stalin re-named Volgagrad to Stalingrad in 1925. Khrushchev changed it back in 1961 as part of his de-Stalinization program. Both changes revealed the nature of politics in Russia. The names of cities were testimonies to the ruling power. That was why the name changes after 1991 were significant. Second, mobs of people pulled down statues of Soviet leaders. One of the statues that disappeared was that of Pavlik Morozov, the 13-year-old boy who informed on his father. He had been made a hero by Stalin after he was murdered at age 15. He had the boy's relatives executed for the crime, although they all denied that they had done it. The Morozov story was taught to Soviet children until the very end of the regime. His statue has disappeared from the public park built in his memory. The fall of the Soviet Union was no deception. It was real. That was two decades ago. There is another fall coming. I will state it again. The breakdown of the European Monetary Union will be followed by the break-up of the European Union. The EMS is breaking down. A few columnists in the West are now admitting this. On the whole, however, the Party Line of the media follows the Party Line of the EU bureaucrats: "The crisis in Greece is a temporary aberration. It will be solved by EU, IMF, and ECB policies." The problem with the Party Line is that Greece keeps flaring up. Short-term interest rates are over 100%, indicating a loss of faith by investors in the Greek government's ability to make interest payments in euros. If the EU, the IMF, and the ECB had a plan to deal with the underlying problem in Greece – its looming inability to make interest payments in euros – they would have implemented it. They keep announcing temporary bridge loans. These "bridge loans" are in fact sinkhole loans. Everyone presumably knows this, yet they do not invest accordingly. The various stock markets' wild gyrations in Europe indicate that hope and fear are balanced, unlike any government's budget. Hope will degrade into fear as reality sets in. What is reality? That large European banks bought Greek government bonds, because they assumed that no member of the EMU would pull out as a way to default on euro-based debt. But it is clear that this is exactly what Greece will do. The default is statistically inevitable. The sinkhole is a bottomless pit. The euro was the poster child of European unification, just as European unification was the NWO's poster child for worldwide unification, the dream of the Trilateral Commission. 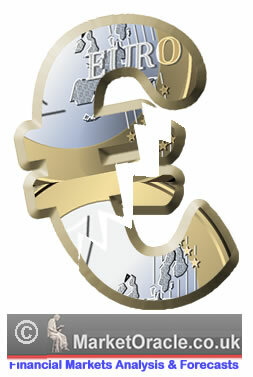 The euro was rammed down the throats of Europe's national central bankers in 1999. They had enjoyed considerable autonomy. National politicians also resented the fact that they would no longer have great influence in domestic monetary affairs. They would henceforth have to persuade the bankers at the European Central Bank to follow policies that would sustain national welfare state policies. That world is gone, but there are domestic politicians in PIIGS nations who would very much like to restore it. They are being pushed hard by voters to break free of the "austerity" programs being rammed down their throats by the IMF and ECB. The Bible teaches, "The rich ruleth over the poor, and the borrower is the servant to the lender" (Proverbs 13:22). This ticks off the borrowers. The Bible also teaches, "The wicked borroweth and payeth not again" (Psalms 37:21a). This really ticks off the borrowers. "That's an insult to our integrity!" Then, when their governments announce limited cutbacks in domestic spending, the threatened employees take to the streets. "You owe us what you have promised!" In short, voters want to impose austerity on the creditors. They do not want creditors to impose austerity on their welfare state governments. Some interest groups are going to get stiffed. The Party Line at the EU, ECB, IMF is that employees of high-deficit countries are going to get stiffed. The Party Line in the Greek trade unions is that the ECB, IMF, EU bureaucrats are going to get stiffed. Politicians in PIIGS nations claim that no one is going to get stiffed if the ECB, IMF, and EU will just lend more money to tide them over. The commercial bankers want the EU and ECB to serve as lenders of last resort to banks, so that, when the PIIGS default, the bankers will not lose their bonuses. Voters in Germany don't want to get stuck with the tab for bailing out PIIGS or banks. Investors in European stocks keep sounding like Rodney King. "Can't everyone just get along?" The New World Order's promoters are wringing their hands and pleading, "We worked so hard to sneak through this deal. We are not quite finished with our plans. Now voters are trying to kill it. It's just not fair!" I think of a classic video scene that best describes the present predicament of the NWO. When the history of the rise and fall of postwar Western Europe is someday written, it will come in three volumes. Title them "Hard Facts," "Convenient Fictions" and – the volume still being written – "Fraud." The author says that the first hard fact was military necessity in the post-War period. The Cold War began. The next hard fact was hard money. He correctly identifies this as "the gift of Ludwig Erhard, author of the economic reforms that created the Deutsche mark, abolished price controls, and put inflation in check for generations." Erhard was a disciple of Wilhelm Roepke, who was a disciple of Ludwig von Mises. In mid-June, 1948, Erhard unilaterally abolished the entire Allied military system of price controls, fiat money, and rationing. The next day – literally – the "German economic miracle" began. The author continues: "The third hard fact was the creation of Jean Monnet's common market that gave Europe a shared economic – not political – identity." The author has fallen for the ultimate fraud. Monnet had been working for political unification ever since he and Raymond Fosdick, John D. Rockefeller, Jr.'s agent, sat together at the Versailles Peace Conference in 1919. In 1919, Fosdick sent a letter to his wife. He told her that he and Monnet were working daily to lay the foundations of "the framework of international government." [July 31, 1919; in Fosdick, ed., Letters on the League of Nations (Princeton, New Jersey: Princeton University Press, 1966), p. 18.] Fosdick returned to New York City in 1920, where he took over running the Rockefeller Foundation for the next 30 years. Monnet was the front man for the New World Order. He promoted political unification by wrapping it in the swaddling clothes of economic unification. The author accurately describes the suicide of Western Europe. In 1965, government spending as a percentage of GDP averaged 28% in Western Europe. Today it hovers just under 50%. In 1965, the fertility rate in Germany was a healthy 2.5 children per mother. Today it is a catastrophic 1.35. During the postwar years, annual GDP growth in Europe averaged 5.5%. After 1973, it rarely exceeded 2.3%. In 1973, Europeans worked 102 hours for every 100 worked by an American. By 2004 they worked just 82 hours for every 100 American ones. He argues that "It was during this general slowdown that Europe entered the convenient fiction phase." One fiction was that adding new members to the EU would enable the European economy to rival the output of the United States. Another fiction was that there was a central core of outlook and values that would unify the new collective. Here, he is woefully naive. That had been the assumption of the United Nations Organization from the beginning, and the League of Nations before it. That was the heart of Monnet's vision. It did not start in 1973. And there was, finally, the whopping fiction that Europe had its own "model," distinct and superior to the American one, that immunized it from broader international currents: globalization, Islamism, demography. Europeans love their holidays and thought they were entitled to a long holiday from history as well. Then he lists the frauds. First, Greece was allowed into the European Monetary Union. But that was not a fraud. The critics in the 1990s said that all of the Club Med nations would run deficits. They warned that the euro could not hold. There was no fraud involved in letting in the PIIGS. This was basic to Monnet's vision from 1919. It had to work. It must work. It is ordained to work. This is the NWO's religion. The non-PIIGS bankers thought it would work. They loaded up on PIIGS sovereign debt. This was not fraud. This was the implementation of a deeply political religion. This was self-deception on a continental scale. Yet he is right on this point. There was the fraud of the so-called Maastricht criteria – the fiscal rules that were supposed to govern the euro only to be quickly flouted by France and Germany and then junked altogether in the current crisis. There was the fraud of the European Constitution, overwhelmingly rejected wherever a vote on it was permitted, only to be revised and imposed by parliamentary fiat. What is now happening in Europe isn't so much a crisis as it is an exposure: a Madoff-type event rather than a Lehman one. The shock is that it's a shock. Greece was never going to be bailed out and will, sooner or later, default. The banks holding Greek debt will, sooner or later, be recapitalized. The recapitalization will be borne by German taxpayers, and it will bring them – sooner rather than later – to the outer limit of their forbearance. The Chinese will not ride to the rescue: They know not to throw good money after bad. And then Italy will go Greek. Europe's crisis will lap on U.S. shores, and America's economic woes will lap on Europe's – a two-way tsunami. He sees that this fraud is not going to hold together. There is a reason for this. The "fiscal union" that's being mooted will never come to pass: German voters won't stand for it, and neither will any other country that wants to retain fiscal independence – which is to say, the core attribute of democratic sovereignty. He makes a forecast: "What comes next is the explosion of the European project." Then he makes an assessment: "Given what European leaders have made of that project over the past 30-odd years, it's not an altogether bad thing." I'll say not. It is a great thing. It is, in fact, the greatest thing that is likely to happen in the first two decades of the 21st century. It is the extension of the two break-ups of the 20th century. But it will come at a massive cost. The riots of Athens will become those of Milan, Madrid and Marseilles. Parties of the fringe will gain greater sway. Border checkpoints will return. Currencies will be resurrected, then devalued. Countries will choose decay over reform. It's a long, likely parade of horribles. The price of the break-up of the ECB, the EMU, and the EU will be high because of the frauds and convenient fictions that preceded them. If Europe's voters had not created welfare states, if they had not consented to a common fiat currency, but instead had abolished all central banking and had allowed competing private currencies, and if they had abolished tariffs and not created a bureaucratic monstrosity of non-governmental agencies with the power of government – the WTO and its peers – there would be low transition costs. But they listened to Monnet. They will now pay the price. So will all of its trading partners. So will the large American banks that sold credit default insurance to European banks. Thank you for your article, Busted Europe, Euro and the European Union Are Going Down, published in today's Market Oracle. In your article you systematically demolish the rational behind the creation of the EU; foretell of its immanent demise, and basically say good riddance. I'm not an economist, so therefore bow to your better judgement. However, I must point-out that Europe was not exactly a bed of roses before the EU. I grew up playing on WW2 bomb sites left over from the Blitz. Towns and villages across Britain have war memorials. World War One cost the lives of 700,000 British servicemen killed fighting Germans. (This would be the equivalent of the USA going to war and losing 40 million men!) And before that the Franco-Prussian Wars, and before that Napoleonic wars, and before that…need I go on? Apart from war, I remember how difficult it was driving across Europe before the EU; queuing up for hours at border crossing, and paying through the nose to exchange currency each time. I remember the debilitating trade tariffs, and the nightmare of doing business. In your article you have presented a solid case pointing to the eventual beak-up of the EU. You may be right, but I for one, dread the thought of returning to the old days. "The EMU is based on a common central bank and a common fiat currency. But without a common system of government, there can be no fiscal union. There can be no central planning by Keynesian means." Any political/economic system (be it based on such philosophies as communism, "free enterprise" capitalism, or Euro type economic union--to name a few current examples of my point) will fail miserably if you put idiots and/or crooks in charge.